The capsule will begin its scheduled three-week-long stay at the orbiting space station. Image released March 3, 2013. A private cargo capsule's trip home to Earth from the International Space Station has been delayed by one day to Tuesday because of weather concerns near its targeted splashdown site. SpaceX's unmanned Dragon spacecraft is now scheduled to splash down at 12:36 p.m. EDT (1636 GMT) on Tuesday (March 26) in the Pacific Ocean, 246 miles (396 kilometers) off the coast of Baja California, NASA officials announced Friday (March 22). Dragon will be carrying about 2,670 pounds (1,210 kilograms) of equipment, hardware and scientific experiments, none of which should be affected by the slight delay, officials said. "The additional day spent attached to the orbiting laboratory will not affect science samples scheduled to return aboard the spacecraft," NASA officials wrote in a Friday update. Dragon launched toward the space station on March 1 and arrived two days later with about 1,200 pounds (544 kg) of supplies. The capsule's current mission is the second of 12 cargo deliveries California-based SpaceX is making under a $1.6 billion deal with NASA. 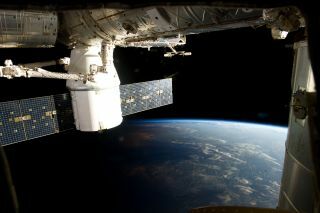 Dragon is slated to be released from the orbiting lab at 7:06 a.m. EDT (1106 GMT) on Tuesday. Its deorbit burn will take place 4 1/2 hours later, setting the stage for its Pacific Ocean splashdown. SpaceX personnel will retrieve the capsule with a crane-equipped boat and return it to shore about 30 hours later, NASA officials said. SpaceX is one of two companies that hold a commercial cargo deal with NASA. The other is Virginia-based Orbital Sciences, which scored a $1.9 billion contract to make eight unmanned flights with its Antares rocket and Cygnus capsule. Antares is slated to make its first test flight in the middle of April, and a demonstration mission to the space station should follow later this year if all goes well. Dragon, for its part, first visited the orbiting lab on a demonstration flight in May of last year and made its first contracted cargo run in October.